Apple Watch online sales in the United States are estimated to have totaled 3,039,353 at an average price of $505 through July 10, exactly three months after Apple began accepting pre-orders for the wrist-worn device, according to the latest data from market research firm Slice Intelligence obtained exclusively by MacRumors. The entry-level Apple Watch Sport has been the most popular model among early adopters by almost a two-to-one margin, with an estimated 1,950,909 units sold at an average price of $381 since April 10. Meanwhile, stainless steel Apple Watch sales are estimated at 1,086,569 units to date, at an average price of $695. Apple has also sold 1,875 Apple Watch Edition models to date, at an average price of $13,700, according to Slice Intelligence. The 18-karat gold Apple Watch models, seen on the wrists of celebrities such as Beyonce, Drake, Kanye West, Katy Perry and Pharrell Williams, cost between $10,000 and $17,000 in the U.S.
Slice Intelligence's data does not include Apple Watch sales in Australia, Canada, China, France, Germany, Hong Kong, Italy, Japan, Mexico, Singapore, South Korea, Spain, Switzerland, Taiwan and the United Kingdom, nor does it account for walk-in purchases made through the Apple Store. 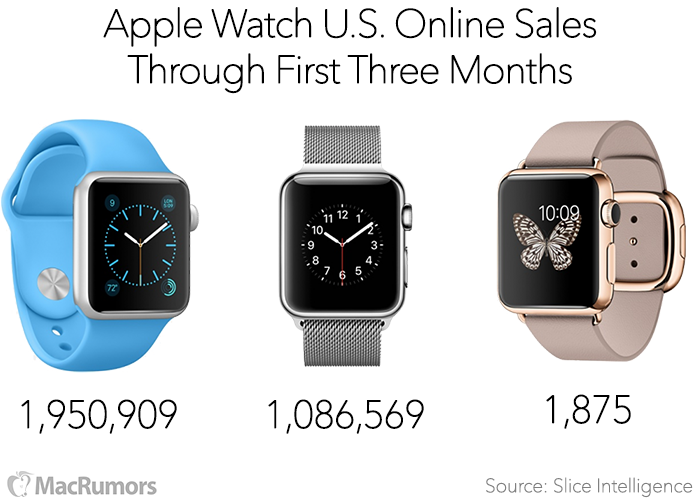 Last week, Slice Intelligence released new data that showed Apple Watch online sales in the U.S. steadily declined throughout June. Specifically, the survey revealed that Apple Watch sales in the U.S. remained consistent at around 20,000 per day in May before dropping to less than 10,000 per day last month. The research firm previously estimated that Apple received 1 million Apple Watch pre-orders at launch, averaged 30,000 Apple Watch sales per day in late May and had topped 2.8 million total Apple Watch sales as of mid June. It also found that around 17% of online shoppers buy at least one extra band for the Apple Watch. Given that Apple has not publicly disclosed any official Apple Watch sales figures, and will be grouping the wrist-worn device under its "Other Products" category in quarterly earnings reports, the accuracy and methodology behind the Slice Intelligence data has been called into question -- so we went looking for answers. MacRumors spoke with Slice Intelligence's Chief Data Officer Kanishka Agarwal and VP of Marketing and PR Jaimee Minney to learn more about Slice Intelligence's methodology. The details below should provide a better understanding of how its Apple Watch sales estimates were calculated over the past three months. Slice Intelligence tracks e-receipts from 2.5 million online shoppers in the U.S., which it claims is the largest panel anywhere, that sign up for the company's value-added services such as Slice and Unroll.me. Slice, for example, is a free app for tracking packages, receipts, price drops, product recall alerts and more. The research firm had a sample size of about 22,000 Apple Watch customers among its panel of 2.5 million online shoppers in the U.S. through July 10, more than double the sample size of about 9,000 shoppers it had when it estimated Apple Watch pre-orders reached nearly 1 million on launch day in the U.S. on April 10. Slice Intelligence also offers an API for developers to provide users with their purchase history and can aggregate e-receipt data through some of these third-party apps and services. The research firm claims to be the only one to provide direct measurement of all digital commerce activity and customer loyalty. Slice Intelligence says it is "very confident" that its Apple Watch sales estimates are within proximity to what Apple has actually sold, noting that its data is measured against third-party sources such as Amazon and the U.S. Department of Commerce with between 97% and 99% accuracy. Slice and Apple have not been in contact. The research firm claims to have a diversified pool of consumers that is highly representative of the online shopping population and balanced to eliminate biases. Agarwal says that his firm's panel lines up nicely with the overall market and is supplemented by detailed competitive insight and data from clients. Apple's Q3 FY 2015 results are scheduled to be released on July 21 at 2:00 PM Pacific. Clearly you've never used one... because you can make calls from your watch without talking to Siri. Either by using the Phone app, or by using the Friends button. That's an extremely specific estimate. 2 harsh realities need to set in for the people of this forum. 1. People just aren't that into wearables (at least in their current state). 2. Apple just didn't do their best on this one. Total numbers alone on a new product, esp from a company with a strong company mean very little when it comes to judging if it's a hit of a miss as a product. It's how those numbers break down. Potential failure as a product. 3rd month 1.5 million sold. this product is really catching on, starting to fly, more and more want them, it's a success as a product. Same numbers, different sales/time = different outcome. Why is Mac Rumors so obsessed with Slice Ingelligence? When in the past have they ever predicted sales of other Apple products and done so accurately? And since their data doesn't include all launch countries how accurate can it be anyway? Congtratulations to the author of this article you managed to get the word "slice" in 15 times, that's impressive, and clearly not a blatant advert for them. Apple has a huge brand behind them. You can bet whatever they put out they'll be a few million Apple loyalists will buy it. For a company like Apple, it is a failure. This whole wearables FAD/Gimmick needs to die. 3M in the US alone? If true it's a huge hit. So much for the Watch "flopping".